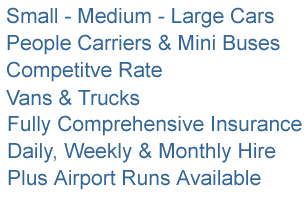 Basildon Car and Van Rental - Basildon based car rental company that offers a comprehensive vehicle rental service. Basildon Car and Van Rentals are a Essex based company that offers a comprehensive Private and Commercial vehicle rental service. From a Fiesta or similar to a 17 seater minibus or Transit Connect to a Luton with tail lift we provide a fast competitively priced service that will fulfil all your car and van rental needs. We deliver and collect within Basildon and the surrounding area - Basildon Hospital, Billericay, Dunton, Laindon, Langdon Hills, Lee Chapel, Noak Bridge, Northlands Park, Pipps Hill, Pitsea, Vange, Wickford. All our rental vehicles come comprehensively covered to ensure you have peace of mind. *Maximum standard booking period 3 months. For commercial and longer term rental please contact Mark on 08453 704702. Our Promise " We will match any like for like quote "
"I hired a van from your pound lane branch to help with moving into my first home. The man we picked the van up from was very friendly and professional and ensured I knew all the controls before taking the van away. We had a problem with a light which was resolved quickly and easily. It made my move so much easier and less stressful having a reliable van from a company I would definitely recommend. They price matched the van for me and just made everything so straight forward. Thank you so much :-)) "
Copyright 2017. Essex Car and Van Rental. Car and van rental in Basildon, Basildon Hospital, Billericay, Dunton, Laindon, Langdon Hills, Lee Chapel, Noak Bridge, Northlands Park, Pipps Hill, Pitsead, Vange, Wickford.